Do you have a favorite area in your home town or city? Maybe you dream of living there one day. For me, it’s an Edmonton community called Glenora. Development here began around 1913, starting with the Government House, the official mansion of the Lieutenant Governors of Alberta. The Royal Alberta Museum is also in Glenora. 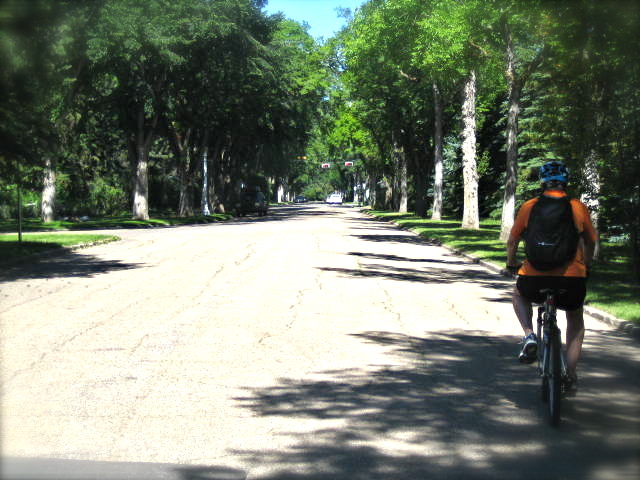 The community is both walkable and close to downtown. Perfection I’d say. The tree line streets will charm you.. It makes for a pleasant drive, or on this day, bike ride. I especially love the homes around Alexandre Circle. In 1952, the residents of Glenora petitioned the City of Edmonton for a fountain, today it’s a sparkling oasis surrounded by floral gardens and benches to rest and take in the nostalgic views. Most of the quant cottages and stately historic homes have been lovingly restored and well maintained. Who wouldn’t want to call Glenora home? I see myself in number one, vote for your favorite (click collage to enlarge). The real estate market is hot, hot, hot and so were we. We stopped at a bench to sip from a jug of JOY. Mmmmm quenching! Did you know the Edmonton River Valley Park is the longest expanse of urban park land in North America? In total, a wonderful 27,394 acres, 60 kilometers of bike paths and 400 kilometers of trails! While the homes here may be a wee bit on the pricey side, the views on our little bike tour were absolutely free, and fabulous! How did I miss this? I love any house with a porch. Hi Marlene! This post is from August 2012 so maybe we hadn’t connected yet. I’m so glad we did because you’re such a dear. Thank you for linking back and thank’s so much for the message. I’m crazy for a porch myself. I hope where ever we finally settle, the home includes one. Fun place to sit out and welcome guest or decorate of Holidays. 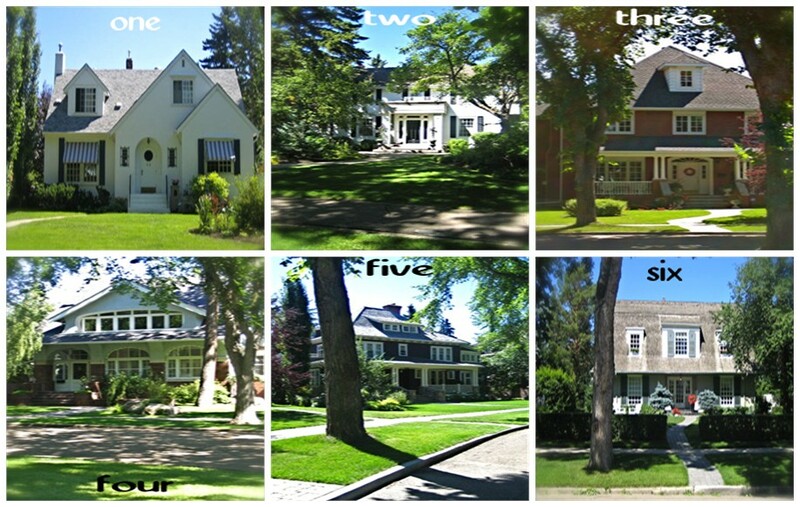 Great story – keep up the good work, – appears u have a oood eye for the different areas and yes Glenora is fabulous. Ha, I think they call that “champangne taste on a beer budget”. OK, maybe not beer budget, but cheaper champagne. Maybe this Cloverdale thing will come together, we’ve got 3 references to check now….exciting! Glenora is very beautiful. It was one of the areas we were looking at as well when we were buying, but ended up in Cloverdale and now in Strathearn. Any area near the river valley is just breathtaking! Oh hey, Edmontonian, welcome. We also love all those area’s and are currently exploring the idea of a new home in Cloverdale. Did you like it there? Why did you move? We loved it there – we had a 2bdrm condo that walked out onto the trails – but after we had a baby, we knew we would need more space. We looked at homes in the area, but the prices were too much for spaces we would still have to reno, so we moved just up the hill and love it! Would I be allowed in the fountain? Oh yes, I would encourage it Clowie. It’d be great if we both lived in the crescent and could meet at the fountain to cool off and then walk down the tree lined streets and snoop around the neighbourhood. Gorgeous! That fountain looks like Paris 🙂 I want to live in #3 for the summer and #4 in the winter! Hey Midcentury, you’re so smart, why would you pick just one, ha that makes me laugh. Good choices. Thanks for coming by. Glendora looks like a nice place. I hope to visit Edmonton again some day. My only visit was on September 11, 2001, and was unplanned. Oh my goodness, I’m so sorry to hear you had to be traveling on that day. We were all very scared. I worked in a tower in Edmonton and at 7:30am got a call from my Manager saying they’d bombed the petagon and New York. I was all alone thinking, ‘is this it’. Hopefully we were caring and gracious in your time of need. Oh my goodness to both of you. So many powerful stories from that tragic day. I couldn’t bare to watch after a couple of days, the pain in the faces of families hoping against all odds that they’d see their loved one’s again….I get teary just thinking about it. I can’t imagine, correction, I don’t want to imagine the heartache. Senseless and tragic. Senseless and tragic sums it up well. I felt sick to my stomach and depressed for at least two weeks, then it transitioned to a low level sadness. My boys were 1 and 4, so didn’t really understand. I was so glad I didn’t need to explain it that day. We didn’t understand it ourselves. Still don’t. After that heartache, we had to endure several more years of policy decisions, a war, human rights violations….I could go on and on. Hopefully Alys, the good in the world will always out weigh the bad. That’s another reason I love John Lennon’s song Imagine so much, it just says everything I’d wish for in a perfect world. He does capture all of that, doesn’t he. There is good in the world, and much of that was on display immediately after 9/11.